From concept development to predictive design analysis and design optimization, enmodes has extensive experience in using computer-aided simulations to improve your innovative ideas without excessive expenses. 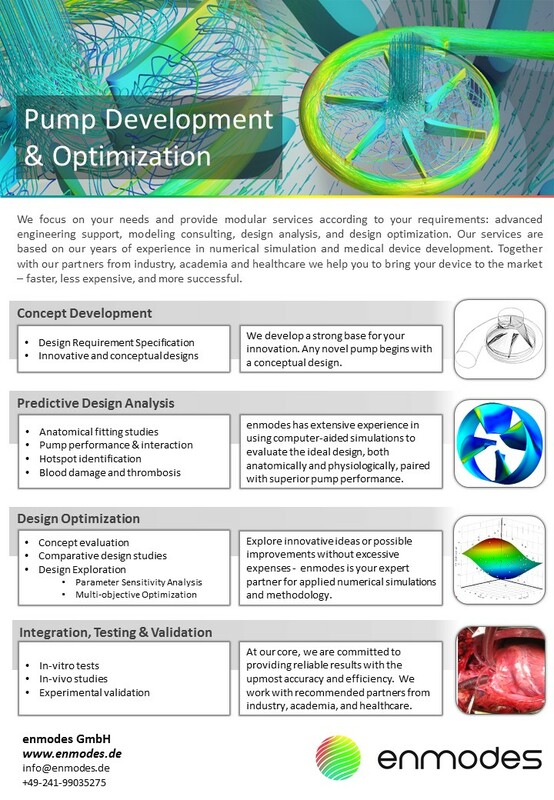 Quantitative evaluation of the pump performance, washout efficiency and durability of a pulsatile Total Artificial Heart (TAH) - enmodes is your expert partner for applied numerical simulations and methodology. Creation of accurate patient-specific models of vascular systems based on imaging data is part of our services. 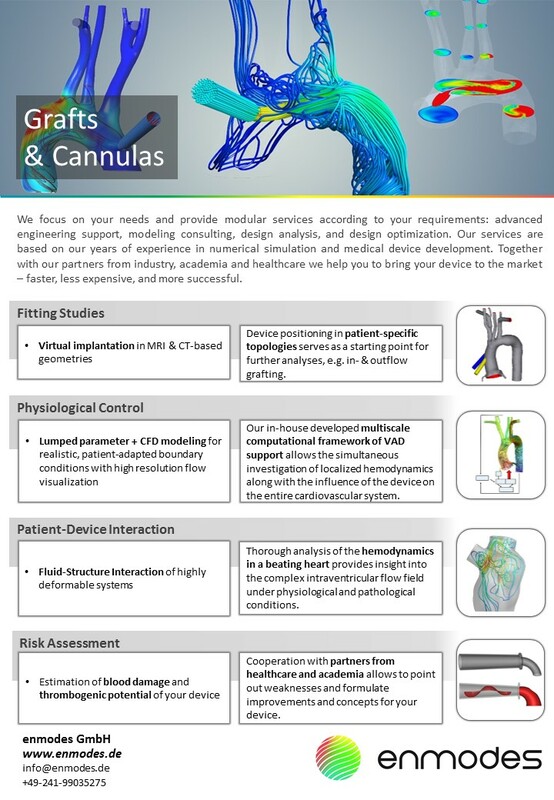 These models are combined with blood flow simulations to analyze different pathologies, procedures and patient-device interactions. Analysis of stresses, fatique, performance and hemocompatibility of mechanical and biological heart valves as well as stents using highly advanced Fluid-Structure-Interaction approaches. Besides fitting studies in MRI & CT based geometries we provide realistic, patient-adapted simulations using our in-house developed multiscale computational framework. Let us investigate blood damage and thrombogenic potential of your device. enmodes GmbH is developing the patented RAS-Q® technology, a device-integrated compliance for gas exchanger. By mimicking the lung’s flexible movement, an extremely low flow resistance and optimised flow guidance is achieved. The technology allows for a more compact size of the system that will for the first time allow severe lung disease patients to get mobilized again. enmodes GmbH is a worldwide service provider in the field of medical technology with special expertise in the field of conception, research and development of medical devices. 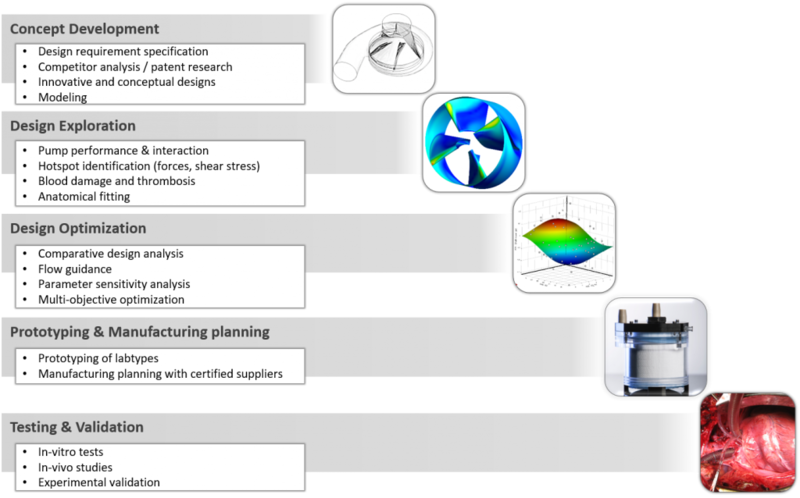 Starting from computer-aided modelling to production, testing and regulatory approval, enmodes accompanies companies on their way to product maturity and market launch. enmodes has many years of experience in the fields of blood pumps, oxygenators, heart valves and cardiovascular interventions.